Scattered throughout midtown Phoenix is a handful of buildings which feature pyramids either in their primary design, capped for accent, or creatively embedded throughout the structure on many levels. What I find most interesting about the midtown pyramid phenomenon is their respective localized concentration despite having been built years apart and by different architects. Pyramid on Central– This is the building most everyone thinks of any time a pyramid-shaped building is mentioned in Phoenix. It is located at 3507 N. Central Ave and is a relatively low key structure. This 5-floor inverted pyramid was complete in 1979 and has been a fixture on central ave ever since. Meridian Bank Tower– Originally known as the “Guaranty Bank Building” it is a high rise building designed in international style. I was constructed between 1959-1960 for developer David H. Murdock and upon completion was the tallest building in Phoenix. In 2011 D. Murdock was ranked 190th richest person in “Forbes 400” list and had a net worth of 2.4 billion dollars as of March 2013. This tower is awash with Masonic symbolism including the Towers of Boaz & Jachin, pyramids, and brick décor mimicking that of the bricks in the pyramid on the back of the one dollar bill. Capping the roof is a flat-topped pyramid which incorporates smaller pyramids extending laterally in all four cardinal directions. The building’s height is 252 feet or “9” in full reduction, or (77) meters. 77 is a scary number when it comes to Freemasons and buildings. Examine for yourself the connections between The Pentagon strike on 911 and its connection to the number 77. Century Link Tower – located in the Phoenix Plaza complex and standing at 397 feet tall, or, full reduction 10 (the number of dominance) is the pyramid-topped tower which one can see for miles in every direction. This is especially true while approaching it from the east along Thomas Rd. It is the tallest building in Arizona outside the downtown area and the 3rd tallest building in the state. 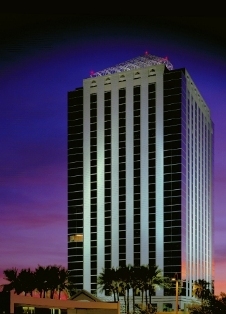 Originally known as the Quest Tower the structure was completed in 1989. The tower’s design is a basic square with vertical setbacks on all four sides providing each actual corner of the tower with three 45° angled corners. The crown is a hip roof, pyramid design and is turquoise (Arizona state gem) in color. The Masons have gone the extra mile here and topped this pyramid with a capstone. Quite fitting for a building housing a business which provides the current platform for the dissemination of information on Earth. Phoenix Plaza Towers One and Two – Towering along Central Avenue and just west of the century Link Tower loom Phoenix Plaza Tower 1 in Phoenix Plaza Tower 2. Coming in at 331 feet tall each of these towers was designed as elongated hexagons and are also fitted with pyramid shaped hip roofs. However, unlike the century Link tower pyramid roofs capped with flat-topped pyramids. 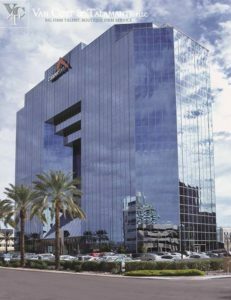 These buildings house some of the highest end attorneys in the Valley of the Sun as well as the National Bank of Arizona, Banner Health, and Deloitte & Touche. Copper point Tower– located at 3030 N. 3rd St. copper point Tower is an exclamation point of Masonic dominance. Also known as Abacus tower, this building stands exactly 200 feet tall and is finished completely in mirrored glass. The tower itself is an elongated octagon but what makes it so striking is the north facing side of the structure. Standing at the front door and looking up one can see a flat-topped pyramid above the door, a pyramid extremely reminiscent of the one on the back of the one dollar bill. But upon further inspection, it becomes apparent that this pyramid is one of four sides of an inverted pyramid jutting into the center of the tower. If this wasn’t enough, the building is also 3 a tiered step pyramid. And if you needed more convincing, above the inverted pyramid sits the logo for Copper Point insurance itself. A deep red pyramid. 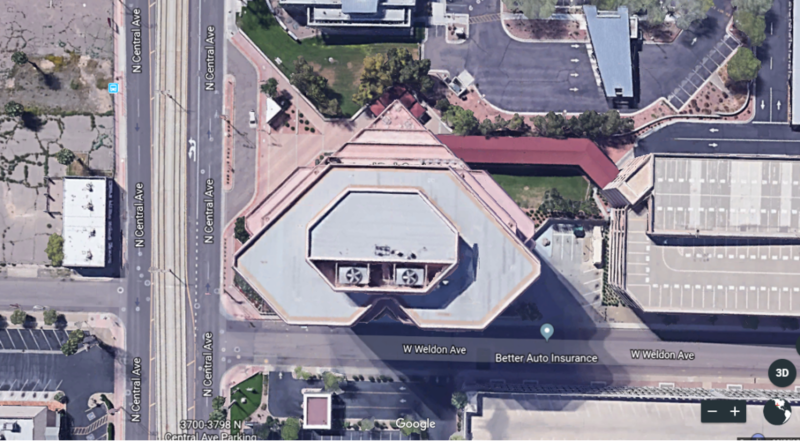 Arizona Dept of Education Career and Technology Building – Located at 3300 North Central Ave. is another building which forms a three-tiered step pyramid when viewed from above. 3800 Tower – This tower is actually one of three towers which make up the Phoenix City Square. Formerly Kent Plaza and Rosenzweig Center, this Del Webb complex was constructed in 1962 and was designed as a dramatic, high quality, self-contained complex of buildings around a landscaped plaza that, at the time, meant to Phoenix what New York’s Rockefeller Center or Philadelphia’s Penn Center meant to the East. Note that this was a HUGE project in Phoenix for its time and place. The 3800 Tower was the first structure in the complex completed and offers 175,000 SF of leasable space. Of course, this is a simple reduction of (13). The appearance of the original structure was identical to the Bank of the West Tower in Albuquerque, NM, Also built by Webb. In 1985 Kent Plaza was sold to Merrill Lynch Hubbard and shortly thereafter Merrill Lynch invested heavily into a refreshing of the property. The mosaic tile panels and aluminum trim were removed and replaced with new marble and blue glass exterior. It was at this time the rooftop was fitted with a new pyramid-shaped metal trellis crown, and a grand east facing pyramid entrance. What is it that prompted Merrill Lynch to fit their newly acquired office space with the pyramid top? What is it with banking institutions and pyramids? I think the answer is obvious enough. Freemasonry. National Park Services Building – located just south of the 3800 Tower is a unique building which embeds a modified south facing pyramid when viewed from the air. This one is actually pretty sneaky as the pyramid is formed from multiple tiers. So there you have it. 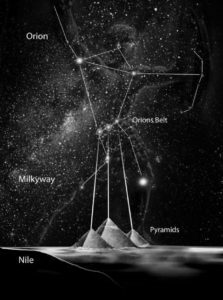 Do you think all these pyramids are coincidental? Is it possible or something deeper going on in the Midtown Phoenix area? I think the answer is most definitely. 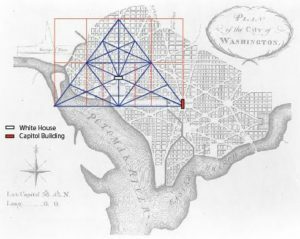 How many other major US cities do you know with a concentration of pyramids like this? To the best of my knowledge, the Midtown Phoenix area takes the cake in this phenomenon. 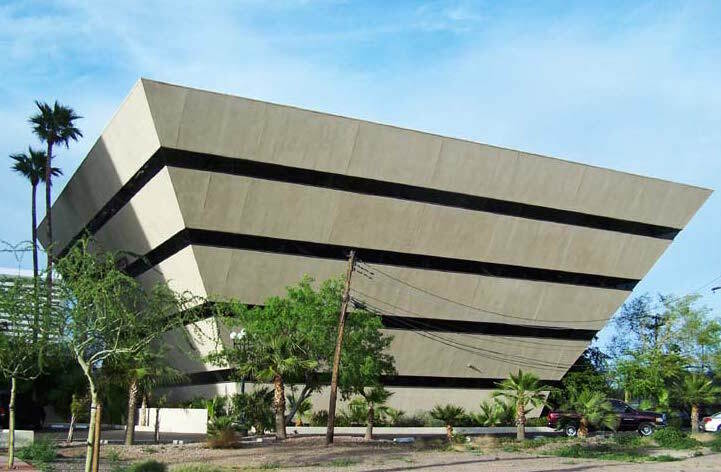 AZ Dept of Education Career and Technology Building – Located at 3300 North Central Ave. is another building which forms a three-tiered step pyramid when viewed from above. This pyramid is that of a “step pyramid” and actually utilizes the corner of the parking lot as the capstone. We saved the best for last. 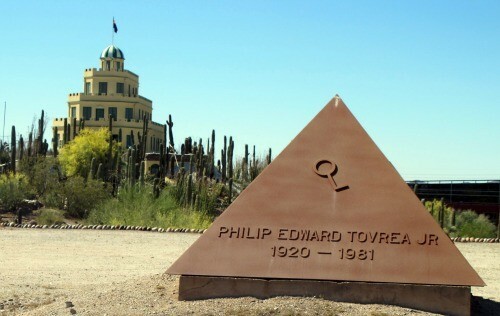 Unbeknownst to even most Phoenicians is the granddaddy of all pyramids in Phoenix. A pyramid embedded right into the street grid in downtown Phoenix. 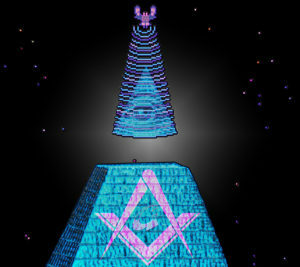 Not only a pyramid but a flat-topped pyramid with an all-seeing eye. Here’s how you see it. Phoenix Arizona is laid out on a north-south-east-west grid. Grand Avenue was the only street in its time which ran at a 45° angle against this grid system. It ran southeast into downtown Phoenix and terminated at Van Buren St. It is grand Avenue which forms the right side of the pyramid and Van Buren which forms its flat top. However, if one were to continue grand Avenue’s trajectory on an invisible path stopping at Washington and making a 90° turn to the left and then continuing northeast, one would have formed the invisible capstone of the pyramid. Here’s where it gets cool. If you take the apex point of where Grand Avenue’s invisible line terminates at Washington and come north exactly halfway between Van Buren and Washington, there is a building at that point. That building is the Montezuma’s grand Masons Lodge. This Masonic Lodge is in the exact place the all seeing eye is on the back of the one dollar bill or any other Masonic symbology for that matter. There is no possible way this is by accident. Although as mysterious as this may seem, this is not an original idea. We’ve seen symbols designed into street grids all through Europe and North America over the last 300 years. Notable cities include London, San Francisco, New York, and Washington D.C. But if you’re wondering if this is all the handiwork of the Freemasons, the answer is a resounding yes. 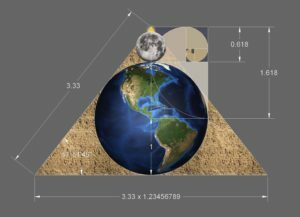 Why use pyramids and other designs in architecture? If one delves into this subject with any fervor they will quickly learn that symbols have been embedded into structures all over the world as far back as we are able to search. Many of which can only be recognized from an areal perspective. This begs the question. Who were these symbols designed for? Who or what would have had to ability to appreciate much less notice these works from an areal perspective? The Nazca lines of Peru are a perfect example of this as are the Intaglios near Blythe CA. I suppose one could infer that they were designed as a form of primitive communication with ancient Gods. But when we find the laid into a street grid system of a modern day city, it seems it’s only a declaration of conquest, a marking of territory. Like most everything the Freemasons do. But is that all? Is that the beginning and end of it? Are the Freemasons that basic and vane? I don’t think so. It is my belief that the Freemasons along with other secret societies and religions have long ago figured out the power of symbols and their ability to manipulate and manage the masses. After all, this is the very idea behind the use of logos. Modern scientists have come quite a long way in the understanding of the human brain. We now know that the human brain intrinsically recognizes 4 basic patterns and infers meaning to them on a subconscious level. This is done in the absence of any learned behavior and seems to be hard-wired into our very DNA. Imagine understanding this and other secrets of the human species hundreds or thousands of years before the masses. Now, imagine constructing a religion which utilizes these symbols and guides the behavior of your fellow man. Let’s go further with this idea and imagine a monarchy sanctioning this religion and embedding this symbolism into its own infrastructure. Well, this is basically the history of this ancient science over the past few hundred years. Could embedding symbols into a street grid system have the same effect on people as a logo would? 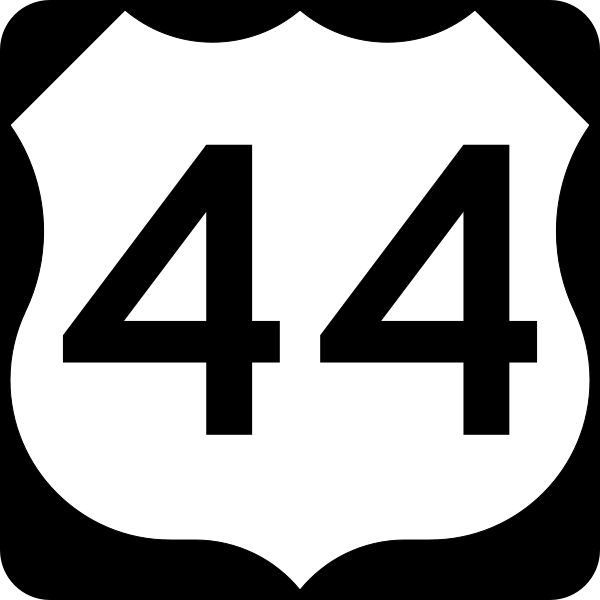 Is the human brain able to recognize a pattern of a symbol if they simply travel along a route? Humans are in essence are pattern recognition machines, and those who lived to procreate along with their offspring represent those humans who excel in pattern recognition. Intelligence is, in essence, the measure of one’s ability to recognize patterns. A person need not understand the meaning of a symbol for it to be effective. The same way they need not understand the molecular structure of a drug in order to feel its effects upon them. It really is this simple. Fascinating! I was born and raised in PHX, and remember when Capstone Cathedral was built; its odd Freemasonry design quirks. But didnt realize all of the other pyramids around AZ. I did however work briefly in the inverted pyramid building on Central for a time.